Doing business over lunch by the pool. The King of Pentacles is a sensualist, an utterly physical man. He is a good business man who does not enjoy business for its own sake, but rather for the things of the flesh that money can buy him. He is authoritarian, stable and reliable. Just don't get between him and his stuff. 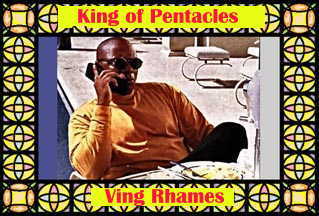 Ving was dragged away from the Rhames Fan Club.